Welcome to T3's guide to the best drone (or unmanned aerial vehicle/UAV, as absolutely no-one outside of the military calls them) of 2019. More specifically, the best camera drone. From beginners to experts, there's a camera drone for everyone and every budget here. Our current expert pick for best camera-equpped drone is the DJI Mavic Air, which sports an incredible mix of advanced tech, affordability and sheer flying fun. This foldable 4K drone also ticks the boxes for versatility, portability and style. Drones will certainly have landed in a lot of people's Christmas stockings, and are now landing in the best New Year sales. When it comes to the best drones, specifically camera drones, the brand that stands far above the rest right now is DJI. This is reflected in the fact that DJI fills numerous positions in our list below, and markedly most of the top spots – that's unprecedented in a T3 buying guide. If the more affordable DJI Mavic Air isn't awesome enough for you, the brand’s new Mavic 2 Pro offers up incredible 4K/20-megapixel videos and images, and is the very essence of fine aerial control and reliability. It’s also highly portable when not flying, as it folds up like a paper plane. It is a touch pricier, though. DJI's iOS and Android apps are excellent, and then the dedicated controller is there if you want to take the drone much further than mobile Wi-Fi will allow. Of the more 'toy-like' brands, Parrot is the leader. However it has just taken a big step onto DJI's more premium turf with the excellent ANAFI. This rivals Mavic Air for video quality and features. In several respects, it can't quite match DJI's fliers – notably there's no obstacle avoidance, so you will need actual skill – but it has a handy ace up its sleeve in terms of pricing: the ANAFI costs around £100 less than its DJI rival. We've rounded up the various Mavics and the rest of the best drones and ranked them in order, for your purchasing convenience. Do you want a selfie drone to snap yourself on the beach or a more serious drone for pro-style aerial photography and filming? The quality of the materials, the range and power of the drone, and the specifications of the accessories – primarily the camera – are the main factors that affect a drone's price. You should be realistic about what you want to achieve and how good a pilot you are. Some of the more pro drones, like the DJI Inspire 2, can be very daunting to fly and have broadcast quality cameras. We'd really like to think that nobody needs to be told any of the above. And in truth, anyone who does fly a drone near aircraft probably deserves to go to prison. Sure, we don't know that a drone can bring down a 747, but we are very sure that we also don't want to test the theory. Ever. If you're in doubt about drone regulations and are confused about where you can and can't fly your drone, head to the Civil Aviation Authority's website and gen up on the latest drone regulations. You can also check out Drone Code UK, which has a handy downloadable PDF with essential information regarding drone flying rules. The Mavic Air is a true pocket rocket that excels in every department. It’s quite a bit lighter and smaller than the DJI Mavic Pros 1 and 2 (168mm in length against 198mm and 214mm respectively) and not much bigger than its smaller sibling, the Spark. Figure in the four folding rotor arms and what you have here is the most portable 4K camera-equipped drone currently on the market. The 4K video quality from the Air’s robust 3-axis camera system is generally on a par with the larger Mavic Pro while its 12mp photos are arguably more detailed and blessed with better contrast. It can also take four styles of panorama images and it does this all by itself. Simply select the panorama function and the drone hovers in one spot while it takes a series of images from different angles (with no pilot input) which it them stitches together to produce a seamless widescreen vista. Like the Spark, the Air can also be controlled with palm gestures or a mobile phone; handy additions for those times when you can’t be bothered to dig out the supplied hand controller. That said, flying with the hand controller is far and away the most satisfying way to operate it. It also lets you fly much further – up to 4km (2.48 miles) away and back again on a battery that lasts around 21 minutes. The Mavic Air’s hand controller is smaller than the Mavic Pro’s and it doesn’t come with an LCD screen so you’ll need to rely solely on the data and picture feed to your smartphone or mini tablet. But that’s no big issue as long as your mobile has enough battery. The element I love most, though, is the addition of obstacle avoidance sensors on the rear as well as to the fore and below the craft. This makes flying more confidence inspiring than ever and is arguably the best reason for choosing a Mavic Air over a Mavic Pro (though not the Mavic 2 Pro, which we review below). For something so small, you’d be amazed at how well this titchy drone copes in winds as strong as 22mph and even higher. It’s also very fast, especially in Sport mode – how does 42mph grab you? Granted, the noise this little tyke makes is higher pitched than the larger Mavic, to the point that it can be a bit irritating. Seriously, though that’s a tiny price to pay for such a cheap, reliable, easy-to-fly and unbelievably well equipped travel package. Although the ANAFI is snapping at the its tail, thanks to keener pricing and a roughly comparable flying experience, the Mavic Air is still out in front. Top marks all round. 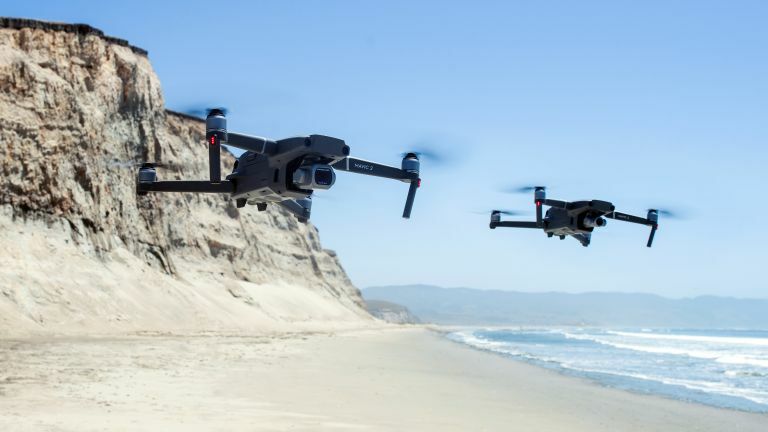 Not content with hogging five spots in our best drone guide, DJI’s just upped the ante and produced not just one new drone but two: the Mavic 2 Pro and Mavic 2 Zoom. We initially received the Pro variant so that’s the one we’ll look at here, though you can be sure we'll be back on the blower to DJI to request a Zoom model in due course. But first let’s put a few things into perspective. To give you some idea of just how far DJI has progressed in the sphere of camera-carrying drones, just three years ago this writer and a mate spent a ridiculous £5,000 on a DJI S-900, a monster drone designed for carrying DSLR-style cameras. This drone had no mobile app integration and was fitted with a huge and very delicate gimbal, more wires than a BT street box and a massive strap-on battery. It also came with a crap monitor that produced a very glitchy low-res video stream from the not-very-good Sony NEX-7 camera. The whole package had to be transported in a box big enough for a lawnmower and it took about an hour to set it all up. Flying it was a terrifying experience. Granted, the visuals it produced were better than the DJI Phantom model of that period, but they still lacked decent sharpness and detail. Fast forward just three years and even the company’s pocket-sized Mavic Air produces video and stills a hundred times better than that hulking pile of Meccano, and for a fraction of the price. That’s progress for you. Which brings us to the current state of play. The Mavic 2 Pro looks identical to its predecessor, though it is 16mm longer, 8mm wider and 173 grams heavier. You can certainly feel the extra weight when you hold it in the hand. In fact, it feels almost too heavy to fly. Put another way, you wouldn’t want it to fall out of the sky because you suspect it might punch a gapping hole in the ground as it disintegrates into a zillion pieces. Just as well, then, that it’s almost impossible to crash given that it has 10 obstacle sensors facing in every direction. To put these omnidirectional sensors to the test, I selected the autonomous ‘Active Track’ follow-me mode on the forever impressive DJI Go 4 app, drew a rectangle around my body on the Samsung S8’s screen (it also works with iOS), hit Go and went for a slow walk between a grove of small trees. The results were frankly unbelievable, scary even – like something out of the ‘Terminator’. The drone automatically ducked and dived as it negotiated a pathway between the branches, never coming to grief despite a few leaf-trimming moments. Even more astonishing was the fact that the footage it shot showed no signs of jerkiness – it was as if I’d been tracked by someone holding a stabilised camera. So, that’s your first reason to buy one. The second reason is the new three-axis gimbal-mounted Hasselblad camera, which comes fitted with a one-inch CMOS sensor – like that in the Sony RX100 and RX10 series – and an adjustable aperture that goes from f/2.8 to f/11. This is an exquisite piece of kit capable of shooting in several video resolutions, including 4K at up to 30 frames per second, 2.7K at up to 60fps and 1080p at up to 120fps. It also takes strikingly sharp 20 megapixel RAW stills. The Mavic 2 Pro’s camera system supports the 10-bit Dlog-M colour profile for pro-style post-production colour grading and 10-bit HDR video for striking hyper-real footage. Flight wise, the new Mavic 2 Pro is as rock solid and confidence inspiring as we’ve come to expect; at no point will you fear it’ll just fly off into the sunset on its own, never to be seen again. With new, larger motors fitted to its four arms, the drone is now capable of hitting 44mph in Sports mode and – with the aid of a larger battery – able to remain aloft for up to 31 minutes at a time. It’s also much quieter than any previous DJI drone – so hushed you can hardly hear it from just 30 metres away. Its Occusync 2.0 transmission, meanwhile, offers crisp 1080p live streaming from up to five miles away. Like the early Mavic, this one also comes with 8GB of onboard storage along with the obligatory Micro SD card slot. The hand controller is pretty much the same as the original, though it does have an additional three-way speed switch (normal, sports or tripod) for extra convenience. Heading over to the DJI Go 4 app, the Mavic 2 Pro comes with a similar range of intelligent flight modes, plus the addition of a new Hyperlapse function that captures stop-frame visuals over a wide area before stitching it all together within the app. In fact, the only intelligent flight mode missing here is the gimmicky ‘gesture’ hand control. This writer is still inclined to hold the DJI Mavic Air at number one, simply because it’s such a convenient and capable little movie maker. But if you’re considering taking your aerial cinematography and/or photography to a whole new professional level, then this is unquestionably the best model to get your mitts on. As the slightly annoying but hugely popular YouTube vlogger Casey Neistat puts it, ‘it’s no longer a case of which drone to buy, but which DJI to buy’. And this one is undeniably the company’s most complete portable cinematic package to date. A review of its stablemate, the Mavic 2 Zoom, will be slipping itself into this list as soon as we get our hands on it. Watch this space. Rather like a car manufacturer launching different variants of the same model, DJI’s Mavic 2 Zoom has the same DNA as its stablemate the Mavic 2 Pro. Both birds are the same size and pretty much the same weight (the Pro is a measly 2g heavier), and they’re both equipped with the same multi-directional obstacle avoidance systems and the very same internals. In fact, the only difference between the two is the camera they’re equipped with. Where the Pro comes with a Hasselblad camera replete with one-inch sensor for professional, high quality aerial photography, the Zoom forfeits image resolution in favour of a 2x optical zoom with a 35mm format equivalent focal length of 24-48mm. However, when it comes to 4K video, both models boast the same rosy specs (4K at up to 30fps, 2.7K at up to 60fps, 1080p at up to 120fps), so this is the model to buy if you plan to shoot far more video than you do stills. You might not use the zoom facility much, mind, but it certainly comes into its own when you want to shoot animals without scaring them off or getting closer to an interesting subject without straying into private airspace – or simply grabbing a money shot without having to fly beyond line of sight (illegal, as it happens). Of course, one of the first things most new owners will do is select the DollyZoom function from the Mavic 2 Zoom's submenu and bore the world of YouTube with a surfeit of Vertigo-style snippets of themselves standing in front of a large subject like a monument or a mountain, while the whole background lunges forward behind them as if it were pumped up on steroids. It’s a brilliant effect used by Hitchcock, Spielberg and other directors but it will probably soon wear thin. Perhaps the most attractive thing about the Mavic 2 Zoom is its price. It’s £250 less than the Pro and yet it shoots the same quality video while sharing the same superb flying characteristics. However, there may come a time when you wish to shoot some ravishing RAW hi-res aerial stills to impress the masses on Flickr and 500px. If that’s the case, we’d recommend opting for the Mavic 2 Pro instead. Parrot’s new foldable ANAFI is the first drone to take on DJI's squadron of premium consumer camera drones, and not get shot down. It's a handy amount cheaper than the Mavic Air, with an rrp of £629.99, and proves only a little less enjoyable to use and fly. Like the Mavic Air, this drone collapses for easy transport but it’s not quite as pocketable due to its 244mm length when folded. Still, it comes in a great transport case that’ll easily fit in a small shoulder bag. At just 320 grams, the Anafi is 110g lighter than the Mavic Air. Should it ever fall out of the sky, it is less likely to sustain major damage. Theoretically, at least. The new Parrot FreeFlight 6 app for iOS and Android is very well designed and easy to get a handle on. Granted, it doesn’t allow for as many camera, flight and gimbal tweaks as the DJI Go 4 app, but it’s perfectly acceptable for first-time users. The HD image quality streaming from drone to phone is impressive, though we did experience a few visual glitches and some pretty poor lag from time to time. In flight, the Parrot ANAFI is not as confidence inspiring as the Mavic Air – it loses quite a few points straight off by not having any obstacle avoidance. Nevertheless, it’s easy to control and very stable in flight, even in a stiff breeze. Firmware updates have improved the GPS and Wi-Fi so they're now seemingly unshakeable. The 2.4-mile range is excellent, though bear in mind that no drone should ever be flown further than line of sight. It’s the law, dude. On the plus side, the battery provides up to 25 minutes of flying time (five more minutes than the Mavic Air) and that’s a massive bonus. On the minus side, it takes hours to charge, so you might want to consider investing £90 or so in a spare battery. Having tested it in the field (literally), both video and photo quality seem on par with the Mavic Air and in low light shooting it’s actually better. It doesn’t offer as high a frame rate as the Mavic Air (30fps in 4K vs the Mavic Air’s 60fps in 2.7K) but the 4K video and 21 megapixel images its 1/2.4-inch Sony CMOS sensor produces are tack sharp, with excellent detail and contrast. The camera also supports HDR (High Density Range) shooting and Adobe DNG/RAW formats for more efficient post-production editing. The controller’s gimbal rocker switch is nothing like as tactile as the Mavic Air’s finger wheel, which makes slow, gentle tilting of the gimbal extremely tricky – I hope Parrot includes a means to adjust gimbal characteristics in a future update. Overall, Anafi isn’t up to the benchmark set by the DJI Mavic Air, which is still the best drone in the sub-£1,000 price band. However, Parrot's competitive pricing should mean it does very well – and deservedly so. DJI’s cute little Spark is smaller and lighter than its closest cousin, the Mavic Air. However, because its propeller arms don’t fold, it won’t fit in a jacket pocket like the folded Mavic Air will. Even so, this air-snap gizmo is still incredibly portable and probably the smartest selfie drone in existence right now, available in five lush colours. The Spark comes with front obstacle avoidance and is rock steady when flown indoors or out. Its camera shoots very acceptable 1080p video and 12-megapixel photos and is equipped with a two-axis mechanical stabilizer for relatively smooth video footage. The battery provides around 16 minutes of flight time, which can be considered quite decent for a drone of this size. The Spark can be operated in three ways: using hand gestures, a mobile device or, for much greater range (up to 1.2 miles), a dedicated hand controller. While not designed for high-quality videography, it still shoots excellent footage. It’s also reassuringly tough as nails, as was aptly demonstrated at a DJI event when one was accidentally flown at full speed – that's 50kph – into a tree. The only thing damaged was a prop; everything else, camera included, worked perfectly. Another great reason to consider snapping one up right away. Despite the arrival of the new Mavic 2 Pro and Zoom models, the original Mavic Pro is still a brilliant option, especially given its new low price. This drone folds into a package the size of a milk carton, flies for 27 minutes for up to 4 miles away while avoiding obstacles, shoots lush 4K footage from a mechanically stabilised camera no larger than a thimble, and then lands automatically in the exact same spot it took off from. It also makes far less noise in the air than its larger Phantom stablemates, especially when used with DJI’s Low Noise props. Like the Mavic Air, you can fly this beauty via WiFi using just an iOS or Android phone. However, for even better control and massive distance – up to four miles – use the dedicated, pocket-sized controller with integrated smartphone holder. Simply plug your phone into the holder, launch the superbly designed DJI Go 4 app and watch gobsmacked as everything – from live HD streaming to a plethora of flight parameters – is transmitted back to the monitor. Gesture control, furthermore, allows you to take selfies and make the Mavic follow you simply by waving arms in the air and making strange shapes with your hands. The Mavic Pro’s OcuSync transmission is more rocksteady than the Mavic Air’s and it also flies for about 5 minutes longer. Nonetheless, I'd still suggest going for the cheaper and smaller Mavic Air, simply because it is has the rear-facing obstacle avoidance that this older, outgoing model lacks. The GPS-equipped Parrot Bebop 2 comes packed with tech that makes it incredibly easy to fly. You can use just an Apple or Android device or, for an even more satisfying flight experience, the dedicated Skycontroller tablet dock. The Bebop 2 flies for up to an impressive 25 minutes per charge and is equipped with an emergency cut-out feature that stops the rotors as soon as they come into contact with an obstacle, which should help prolong its life. It’s also light enough to survive the occasional crash. The Phantom Pro is more aerodynamically styled than its predecessors and features three-sided obstacle avoidance, a flight time of 30 minutes, a top speed of 45mph and a flight range of 4.2 miles. There’s more. Hop on your skis and it’ll track you using its ActiveTrack feature or, if you’re a lazy flyer who can’t be arsed with using a remote controller, a touch of the app’s TapFly button will send it off in the direction of your choice, avoiding any solid obstacles en route. DJI’s also developed a special remote controller with a built-in 5.5-inch screen that is brighter than most smartphones. Like the new Mavic 2 Pro, the Phantom Pro’s camera features a one-inch CMOS sensor (like that in the Sony RX100) capable of capturing 4K footage at up to 30 frames per second and 2.7K at up to 60fps. It can also shoot 1080p at 120fps – ideal for capturing fast-moving moments in slow motion. Make no mistake, this drone is still a class act, but clearly, the new foldable Mavic 2 Pro and Zoom are about to steal its thunder. In fact, this may well be the last time we ever see the Phantom’s iconic, if bulbous, shape. Swansong or not, one shouldn’t forget that this is the model that gave every budding photographer and cinematographer wings – and access to a whole new level of creativity. The Phantom remains great, even if it will soon be ghosted. This impressively built, folding pocket drone is smaller than an iPhone and nearly £200 cheaper than the DJI Spark although, it should be said, it doesn’t sport nearly as many features. Dobby is a damn easy thing to get off the ground, and can fly up to 100 metres away via Wi-Fi from any iOS or Android device. Just unfold the prop arms, sync your phone and open the DoFun app. Now launch Dobby from the ground or toss it out of your hand and tap one of its intelligent flight modes – face/target tracking, video selfie, orbit and somersault. You can even control it with your voice, though I can’t see many British people over the age of 12 using this feature in public. Dobby can shoot in 4K but only when digital stabilization (EIS) is off. As soon as you switch EIS on – and you need to, realistically – the image is cropped to 1080p. Also, because the camera’s angle can’t be controlled from the app, you’ll need to tilt it manually to your preferred angle before take off. Dobby takes pretty good 13 megapixel stills but, because its camera doesn’t have a gimbal, you do get an awful lot of rolling shutter (jelly-like movement) when shooting videos. This is fixed to some degree by the tiny ND filter they now ship with the drone but it’s still far from perfect. In a nutshell, the supremely portable Dobby may not be much use as a cinematic video drone unless there's almost zero wind, but it is brilliant for taking selfie snaps and short video bites. When it comes to producing the very best cinema-quality aerial footage, there is simply nothing out there to touch the Inspire 2. In fact, the only reason this drone isn’t higher up our chart is because it is pricey with a capital P and large with a capital L. It also weighs a hefty 4.25kg, so you can forget about sticking it in your hand luggage. The Inspire 2 is made from carbon fibre and magnesium and its dual battery system, four huge motors and 13-inch propellers will take it to a top speed of 58mph and a flight time of up to 27 minutes. The landing gear is retractable, allowing pilots, or a second camera operator, to shoot a full 360º panorama. It also comes with forward, downward and upward-facing obstacle avoidance sensors for extra confidence when flying in tricky locations. The Inspire 2’s pro-spec CineCore 2.0 image processing system is housed in the nose of the craft which means only the camera’s lens and sensor are attached to the gimbal. This reduces weight and allows for easy camera swapping. And speaking of cameras, the Inspire 2 comes with a choice of five different models, from the compact Micro 4/3 Zenmuse X5 to the ultra high-end Zenmuse X7, which features a Super 35 Sensor capable of shooting in 5.2K Apple ProRes. Needless to say, the imagery this stunning cinematic system produces is of the very highest order. The pick of the indoor toy drones, although it'll also venture outside without being smashed to pieces, the aerobatic Parrot Mambo is a master of stability and a great drone to practice on. Indoors or in a windless outdoor space, this little fella hovers so perfectly that you could pop off to put the kettle on and when you return it’ll still be in the same spot (don’t try this outdoors, mind, or the wind will cause it to drift). However, what really elevates this little drone is the recently added FPV pack option, which gives you a Mambo's eye view of you lounging on the beach, via your phone's screen, similar to the Bebop 2 above. The goggles are not the last word in comfort or high-tech, but the first-person view does definitely make flying it easier and more exhilarating. You’re not going to get ravishing aerial footage out of this drone – it doesn’t have a camera stabilizer for a start – but if you hold the drone steady while it’s in flight, its little clip-on camera will shoot surprisingly decent 720p footage and perfectly adequate stills.